However, before we learn how to start a keto diet, we must develop a deeper understanding of what it is and why it is so effective. Knowing the what and why behind this way of eating plays an integral role in your keto diet success as well as knowing how to get started. Why does the keto diet work? How long can I follow the keto diet for? How do I know if I am following keto correctly? The keto diet can be described in many different ways, but the most common definition is that it is a high-fat, low-carb, low-to-moderate protein diet. However, if you don’t know what phrases like “high-fat” and “low-carb” mean it is difficult to understand what eating keto actually looks like. The simplest way I’ve found to conceptualize the keto diet is this: If you restrict carbs to the point that you enter and sustain ketosis, you are on keto. Ketosis is a metabolic state in which your body is consistently using and burning a highly efficient alternative fuel called ketones. To produce ketones and enter ketosis, we must continually trigger a process in the liver called ketogenesis. The healthiest way to do this is by limiting carb consumption more than any other low carb diet. This is why this version of the low carb diet is called the “ketogenic diet” — Its primary objective is to limit carbs to the point that you stimulate ketogenesis and enter nutritional ketosis. If you’re not promoting ketone production and maintaining ketosis, then you are technically not on the keto diet. However, this begs the question: Is undergoing such a massive shift in your diet so that you can be in ketosis worth it? The keto diet is simple but may be difficult to adapt to at first. To go from eating all of the high-carb foods you desire to filling up on fat for fuel requires a massive change in your physiology and in your lifestyle. Are the results of this keto journey worth the climb? It depends on the person. For many people, the answer is a clear and definitive “yes.” High-quality studies on the keto diet have found that it consistently leads to the same amount or slightly more weight loss than many other popular diets. Furthermore, the current research also indicates that keto can help with many of the common conditions that people struggle with today, including heart disease, type 2 diabetes, and Alzheimer’s disease. It naturally reduces calorie intake. The keto diet encourages the consumption of highly-satiating whole foods and the restriction of appetite-stimulating processed foods. Because of this, many keto dieters feel full throughout the day without needing to eat as many calories as before. This spontaneous reduction in calorie consumption typically leads to weight loss and the improvement of various biomarkers linked to heart disease and type 2 diabetes. It increases ketone use. Ketones are our most efficient energy source in many ways, but they aren’t produced unless we lack the sugar needed to support brain function. When we burn ketones for fuel, they have many positive effects throughout our body, including brain health optimization, increased energy levels, and appetite reduction (among other benefits that you can learn about by following this link). This powerful combination of sustainable calorie reduction and ketone production is what makes the keto diet unique and useful in ways that other diets cannot emulate. Plus, you can follow it for as long as you desire (we will take a closer look at this later in this article). To achieve your health and body composition goals, however, you must overcome the hardest part of most diet plans — getting started. Fortunately, making the switch to keto isn’t difficult when we filter out all the unnecessary info and break it down into three easy-to-follow steps. Eat the right amount of those foods. Prepare for the keto flu. Just by following this step alone, many people are able to lose weight and improve their health significantly. By replacing carb-heavy foods with keto-friendly foods, you will naturally eat fewer calories than before, causing you to lose weight and enhance many aspects of your health. If you’d like to see the full meal plan along with its corresponding shopping list and budget breakdown, click here. You can also create your own keto meal plan by browsing through our keto recipe page. Or if you’d rather have most of the work done for you, check out our Keto Academy to get comprehensive meal plans, shopping lists, and expert guidance. When you start restricting carbs, you’ll notice that so many of your favorite foods come with added sugars and carbs. These foods can quickly kick you out of ketosis and turn your keto diet into a lackluster low carb diet. Read labels carefully. Anything that comes in a package (this includes any calorie-containing beverages and common medications like cough medicine) may be filled with hidden carbs. Make sure the ingredients label doesn’t have any ingredients like maltodextrin, dextrose, sugar, cane syrup, starch, etc. because these ingredients can increase blood sugar levels and impair ketone production. Use keto friendly sweeteners and flours. Sugar and flour are hard to eliminate for the diet completely, but it is possible if you know what to replace them with. For more info on keto-friendly sweeteners that you can use, check out our guide to sweeteners. And if you are looking for keto-friendly baking ingredients, read through our guide to keto flours. 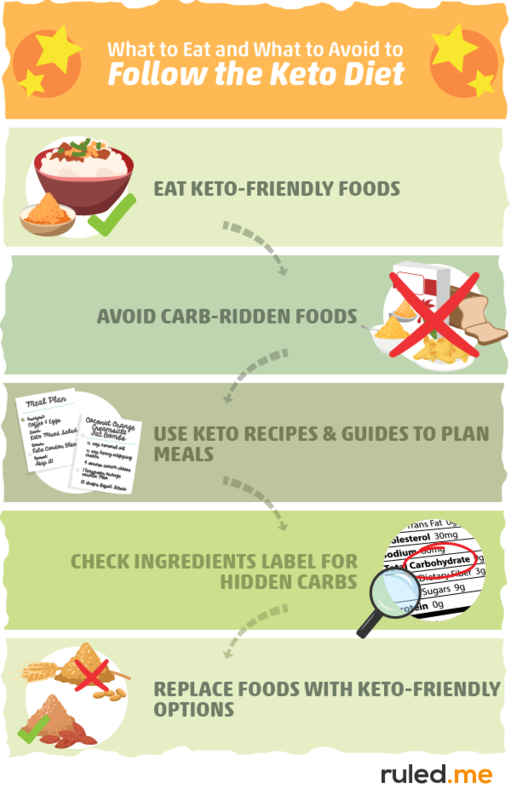 By following step 1 of starting a keto diet (i.e., exclusively eating keto-friendly foods), you will be able to experience many of the benefits of keto dieting — even if you don’t track your calories or net carbs. However, to increase your chances of getting the results you want, it is best to follow step 2 as well. Your calorie consumption (i.e., how much you eat) is the most important variable to be aware of when you are trying to lose or gain weight. If eating keto foods (i.e., following step 1) isn’t getting you closer to the results you want, you may need to track how much you eat more precisely. When we eat fewer calories than we use throughout the day (i.e., we are in a calorie deficit), we lose weight. When we eat more calories than we use throughout the day (i.e., we are in a calorie surplus), we gain weight. And the two previous statements hold true regardless of the fat and carb content of your diet (when calorie consumption is equal). Severely restricting calories (i.e., extended fasts and very low calorie diets) will cause dramatic weight loss that increases the likelihood of hormonal issues and weight regain in the future. Being in an excessive calorie surplus will cause an increase in fat mass and health issues like heart disease and type 2 diabetes. Altogether, we can conclude that — if you want to gain or lose weight in the healthiest way possible — slow and steady wins the race. In fact, research indicates that losing weight at a rate of 1 to 2 pounds per week is best. Check your results and adjust food intake from there. This method requires you to measure your results every 3-5 weeks and change how much fat you eat based on what you find. Losing weight too fast and feeling fatigued all the time? Eat a bit more fat with your meals or add a keto snack to your day. Barely losing any weight? Reduce the fat content of your meals. After making the appropriate adjustments to your keto diet, check your results after another 3-5 weeks to see if you are reaching your goals at a healthy pace. 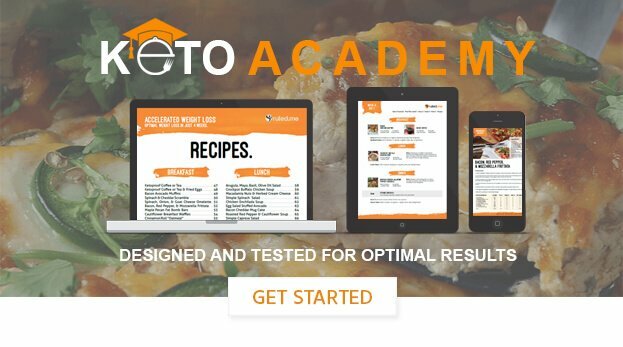 For more in-depth info on how to use this method, read through the “How to Find Out How Much Fat You Need to Eat on Keto” section of this article. Use our keto calculator and track your calorie consumption. If you’d rather be more precise with your food intake, I recommend using our keto calculator to establish a starting point for your calorie, fat, carb, and protein consumption. Once you know how much you need to eat, try using a calorie tracking app like MyFitnessPal or Cronometer. Both the calculator and the tracking app will help you figure out exactly how much you need to eat every day to reach your goals. Here is a link to our keto calculator and our guide to tracking calories on keto to help you get started. Fat, Protein, and Carb Intake: How Much of Each Macronutrient Should You Eat? Although calorie consumption is one of the most critical variables that determine whether you lose or gain weight, you must also take note of how much fat and protein you eat if you want to decrease your body fat % and maintain (or build) as much muscle mass as possible. Carbohydrates. Without restricting carb consumption, you cannot enter ketosis. For most people, we recommend eating below 35 grams of carbs a day. Don’t worry, carbs are technically not essential, so most of us can get away with limiting them as much as we want. If you want to find out how to personalize your keto carb limit based on your goals, check out this article. Fat. On the keto diet, fat will be your primary calorie source, so it is essential that you eat enough to get the results you want. To help you figure out your ideal fat intake, use our keto calculator. 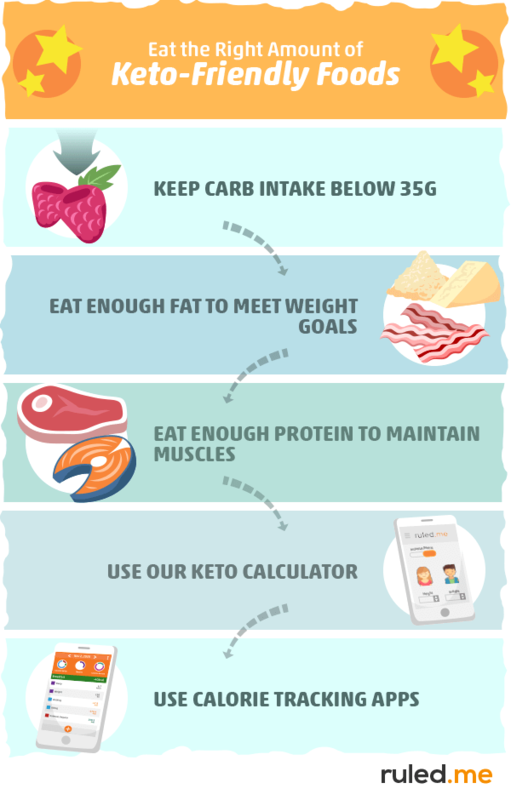 For more specific info on how to adjust your fat intake based on your results, check out our guide to fat consumption on keto. Protein. Protein is an essential part of every diet. Without eating enough, you will increase your likelihood of losing muscle mass, and your overall health and well-being will suffer. On the other hand, eating too much protein can decrease ketone production. This is why it is essential to eat the right amount of protein while you are keto dieting — not too much, not too little. The simplest way to find your ideal protein intake is by using our keto calculator. The most effective way to lose (or gain) weight is by eating the right amount of calories. Since fat will be your main source of calories while you are on the keto diet, you will need to adjust your fat consumption based on the results you are currently getting and the results you want to get. Eating fewer calories than you need to maintain weight will lead to weight loss. Eating more calories than you need to maintain weight will cause weight gain. It is healthiest to lose weight at 1 to 2 pounds per week. While you are on keto, it is important to eat the right amount of each macronutrient as well. Keeping carbs lower than 35 grams per day will help you stay in ketosis. By manipulating your daily fat intake (your main calorie source), you can increase/decrease weight loss or increase/decrease weight gain. Eating the right amount of protein will help you preserve muscle mass as you lose weight. By following steps 1 and 2, you will vastly increase your chances of getting the results you want. However, you will only see progress if you stick to the diet, which may be more difficult than you think. Even the most strong-willed of us may give up if we don’t take notice of step 3: preparing for the worst. If you have never tried the keto diet before, you are probably a carb-burning machine. By following keto, you will be robbing your body of its primary fuel source — and this abrupt dietary shift will cause many changes throughout your body. As a result of these changes, you may experience something called the “keto flu”. 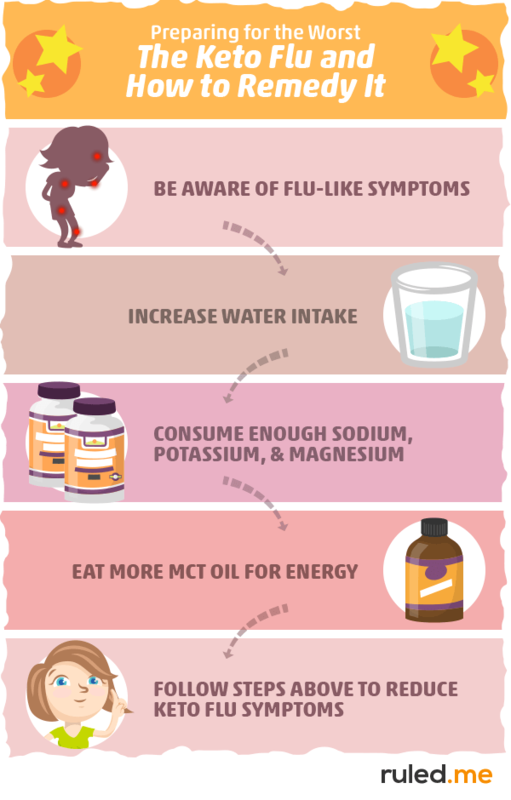 Keto flu is basically an umbrella term for the flu-like symptoms that may occur as your body adapts to a significant decrease in carb consumption. Fortunately, you can make it through this flu — especially now that you are going to be prepared for it. For more specific info on the keto flu, its symptoms, and how to remedy it, check out this article. The person is able to achieve a healthy weight and body composition on the diet. The person is “healthy” while following the diet, as indicated by relevant lab tests and their overall sense of happiness and well-being. The person can maintain their keto lifestyle without it diminishing their quality of life. These three conditions serve as helpful indicators for how safe and healthy keto dieting is for you. When all three are met, keep doing what you are doing (unless, of course, your doctor strongly advises against it). However, if you find that the keto diet is difficult to stay with for the long-term (for any reason), you can also use it as a short-term tool to help you lose some extra weight and/or improve various health conditions. For example, many keto dieters don’t actually stay on keto all year long. Instead, they will follow a strict keto diet for a couple of months or so, transitioning back and forth between ketosis and increased carb consumption throughout the year. No matter what dietary approach you choose to use, make sure it allows you to maintain your health, well-being, and results. If your diet isn’t doing these things for you, try making adjustments (based on some of the principles you learned from this article) until it does. Although the research and success stories for the keto diet are promising, they do not apply to everyone. Just because someone thinks the keto diet is the best diet for them doesn’t mean it will be ideal for you. How you feel. Once you follow the three steps to starting the keto diet, pay attention to how you feel. Are you feeling better than you did with your previous lifestyle? Or, are you feeling down and drained most of the time? If you are really struggling with keto after 1-2 months, then consider adjusting your way of eating so that it fits better with your lifestyle and eating habits and enhances your sense of wellbeing. Body composition. In most cases, people use the keto diet to lose fat. One of the simplest ways to keep track of your fat loss is by using the scale and measuring your waist circumference. If both the number on the scale and your waist circumference are going down, then you are on the right track. If not, then we recommend using one of the strategies from our article on weight loss plateaus. However, don’t make any changes to your diet until you’ve followed it for at least 3-5 weeks. Your waist circumference and weight will naturally fluctuate from day to day. Monitoring these numbers every 3-5 weeks will provide you with a much more accurate representation of how well your diet is working for you. In other words, if you aren’t losing weight or inches after a week, don’t panic. Stick with your diet plan for at least 3 weeks before you check your progress and adjust your diet (if you need to) from there. Blood biomarkers. Sometimes how you feel and how much weight you lose don’t reflect what is happening inside your body. For this reason, we recommend consulting with your doctor before and after making this dietary change. Pay close attention to how your blood-work changes after you’ve followed keto for at least a month. Keep track of what happens to your blood sugar, cholesterol, A1C, and triglyceride Although research suggests that keto can help improve each one of these biomarkers, some people may experience the opposite. For those of you who find that keto is taking your biomarkers to unhealthy levels, you may want to dial your fat consumption down and increase your carb consumption from whole foods to see if that helps improve your blood-work and overall health. Ketosis. To find out if you are reaping all of the benefits of keto, you will want to make sure you are in ketosis. 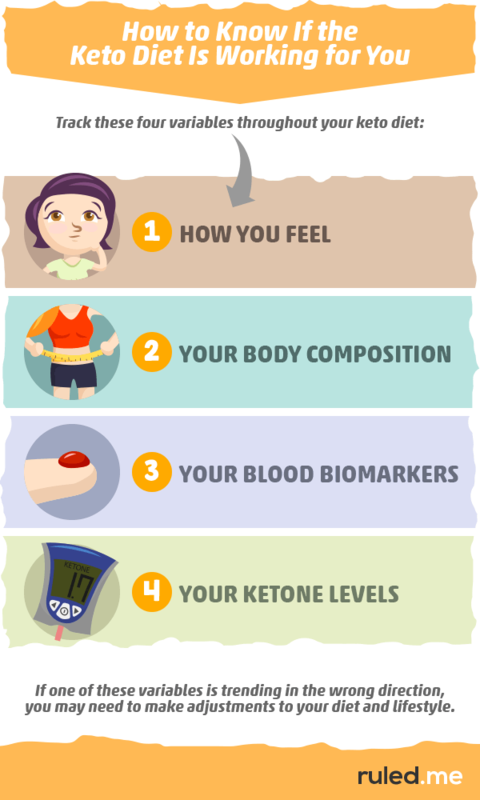 You can do this by checking for the signs of ketosis or investing in ketone tracking tools. If are struggling to get into ketosis, you may need to (1) decrease your carb consumption and check your medications and packaged foods for hidden carbs, (2) eat less protein (but only if your protein intake is high), or (3) use a blood ketone tracking meter to get a more reliable measurement. Eat keto-friendly foods and avoid carb-ridden foods. Eat the right amount of calories, fats, carbs, and protein to meet your goals (use our keto calculator and calorie tracking guide to help you with this). Is keto safe and healthy for me? Is keto getting me the results I want? Am I following keto correctly? Want to learn more keto diet success tips? Click here. Struggling to break through your weight loss plateau? Read through this article. Looking to gain muscle? Check out our guide to keto bodybuilding. Looking to maximize exercise performance? Check out our guide to keto and exercise.